A delicious and quick to make capsicum rice for lunch or dinner. 2. Fry the dals and mustard seeds for 30 seconds or until dals turn golden. 3. Add the green chilli and capsicums. 5. Add the cooked rice and stir well. 6. Add turmeric powder, asafoetida powder, curry leaves, coriander leaves and salt. 7. Mix well and cook for a minute. 9. Remove and serve warm. 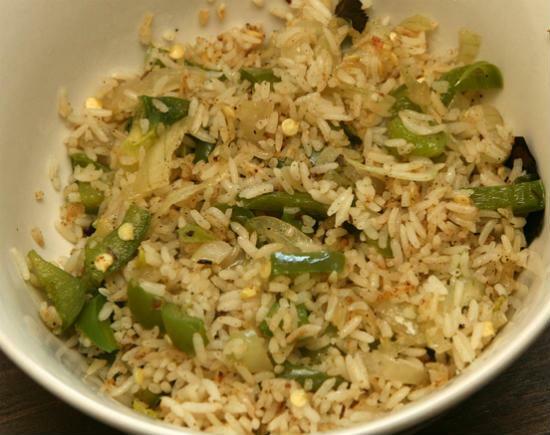 Feel free to comment or share your thoughts on this Capsicum Rice Recipe from Awesome Cuisine.